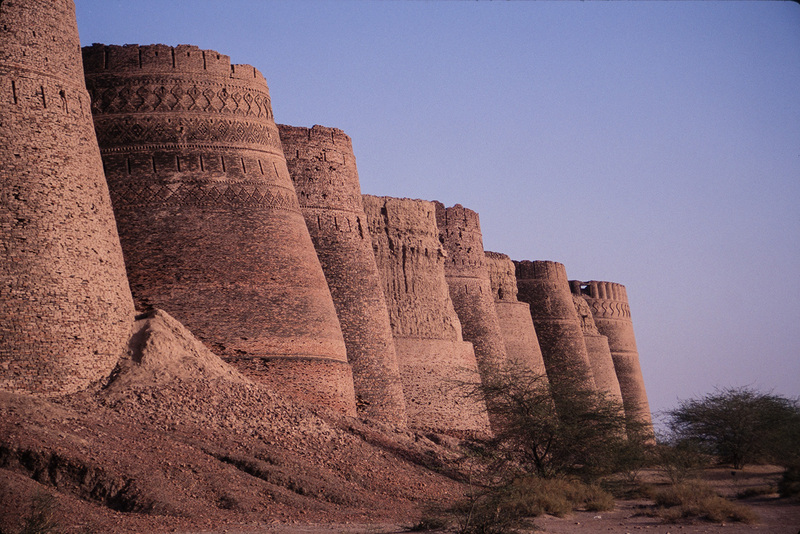 Close to Bahawalpur on the edge of the Cholistan desert, there has been a fort here for 5000 years as it is on the ancient trade route from Central Asia to India. The towers are 40 meters (130 feet) high and there are ten on each of the four sides. The whole is over a mile in circumference. The site was captured by the Abassi family from Raja Rawal Singh of Jaiselmer in 1733, and the present fort dates from that time. The area was once watered by the Ghaggar (Hakra) river, which was known in ancient times as the Sarasvati, along the 300 mile length of which are numerous arcaeological sites dating from the Indus Civilzation. In the 18th century some 12,000 people lived in the town below the walls of this fort.